This hotel offers an excellent location in the heart of Munich across the street from Munich’s Main Train Station near shopping, museums and beer gardens. The hotel offers 381 rooms and suites, Wi Fi, 24-hour room service and more. The ideal location for a pre or post Danube River Cruise embarking or disembarking in Passau, Germany approximately a two hour drive from the hotel. 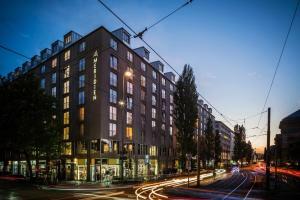 Located in the heart of the city, conveniently across from the main rail station, Hauptbahnhof.